Jane Albright, head women’s basketball coach at the University of Nevada, visited National Agents Alliance on Monday to meet with President and Chief Executive Officer Andy Albright and to speak to the corporate staff. Jane Albright, a first cousin of Andy Albright, grew up in Graham, N.C.; played collegiately at Appalachian State University and began a coaching career that led her to Northern Illinois, Wisconsin, Wichita State and her current job in Reno, Nev. She’s coached teams to NCAA and WNIT appearances, often seeking jobs where those accolades had never been achieved. Albright has coached alongside Tennessee women’s coach Pat Summitt, who has won more 1,000 games – more than any other men’s or women’s Division I coach. She also had the opportunity to spend a great deal of time with the late John Wooden, UCLA’s legendary men’s basketball coach who won 10 NCAA titles in his career. Albright led the Wolf Pack to a school record for wins during the 2010-11 season. After touring NAA headquarters, Albright spent time with the corporate staff and fielded questions from several staff members. Andy Albright said after spending time with his cousin in March of 2011, he wanted her to meet his team. 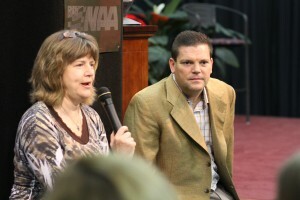 The veteran coach encouraged the National Agents Alliance team to not be afraid to make mistakes, but cautioned them to learn and not repeat missteps. Albright shared her “STUFF” (STUPH: Servanthood, Thankfulness, Unity, Passion and Humility) philosophy that her players follow. Jane Albright praised Andy Albright for allowing his staff to choose one book a month – at their choosing – to grow personally and in their occupation. “People don’t read,” Jane Albright said. “The books you are reading are awesome. If you can develop that discipline to just read and think about that stuff, it makes a huge difference. Albright, who just completed her third season at Nevada, wrapped up her visit by telling the group to keep things in perspective.